His love songs have inspired millions, but over the weekend Sir Paul McCartney had a more direct role in the love story of one Canadian couple. The former Beatle was in Winnipeg, Manitoba, for a concert when he photo-bombed a couple taking pictures before their wedding. The moment was immortalised by the couple’s wedding photographer. 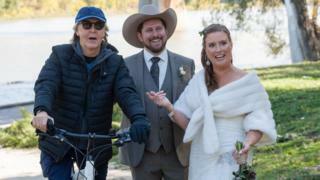 “He said congratulations as he rode by and Steve said, ‘That was Paul McCartney,'” bride Jen Roscoe told the CBC after the pictures were posted online. That’s when Mr Gregg plucked up the courage to ask for a picture. “It was very brief, he shook our hands, said congratulations took a couple quick photos and then they were off,” he told the CBC. “This is was a nice thing on a day filled with wonderful events,” Mr Gregg said.